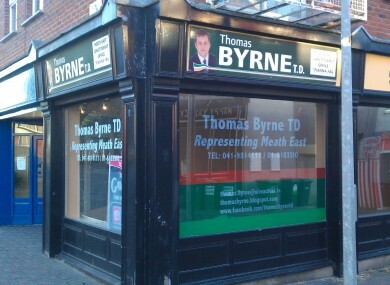 The former office of Thomas Byrne in Duleek today. A FIANNA FÁIL senator has insisted that no one is confused about him no longer being a TD. His comment is a response to a constituent’s complaint that his former office in Duleek, Co Meath still bears signs which read: “Thomas Byrne TD Representing Meath East”. Thomas Byrne lost his Meath East seat in the February general election and has since entered the Seanad. Despite this his old office on Main Street in Duleek, which lies on the border with Louth, still carries signs saying he is a TD. Byrne says he does not know the auctioneer or owner of the property, does not have access to it and insists there is nothing misleading about them. I can absolutely assure you that there is nothing misleading about those signs. Absolutely everyone knows I am no longer a TD. Nobody is confused. I don’t own the premises and have no access to them, I was out on the Monday following the election. In fact, judging by the votes I received in the Duleek area in February and the reception I received today, there’s plenty of people around who wish I was still a TD and the office was still open. The Department of Environment has confirmed that Byrne is not in breach of any laws or regulations in relation to election or party political material being on display as it is a private property. When contacted by TheJournal.ie yesterday, Byrne insisted there was “absolutely no confusion about my role” and maintained that every single constituent in Duleek knew he was no longer a TD. He said there were “far more important issues to deal with” and maintained that he was in no way misrepresenting his role. Byrne, a former solicitor, was elected to the Meath East constituency in 2007 but lost his seat at the last election. He was elected to the Seanad on the Cultural and Educational Panel in April of this year. He says he still holds regular monthly clinics throughout Meath-East. Mr Byrne, I am a resident in Duleek and I would be grateful if you could have the sign writing on your former office in Duleek removed. It is misleading and very unprofessional on your behalf. It has been 6 months since the general election there could not possibly be any excuse for not removing it. I do not have an office in Duleek, following the general election in February. If you have any issue with the premises, perhaps you might take it up with the auctioneer/owner. You might also note that as you seem to be concerned with professionalism, the “f” in “Yours faithfully” should be in lower case. Firstly, Thank you for your swift response and your lesson in grammar. I did not suggest you have an office in Duleek I stated my concern was with your former office in Duleek. I would be obliged if you could clarify something for me though… I believe you to be an honest and reasonable man and both you and I know that your former office in Duleek is still displaying sign writing with “Thomas Byrne T.D. Meath East” or something close to that. Now if I could put it like this I believe that lets say if I owned a van that had sign writing on it saying “Alan O’Brien Plumbing Services” and decided to sell on that van it would be my responsibility to remove the signs once the van is no longer mine. So I would like know if you believe that it is not your responsibility to have the signs removed. I also wish to express that I do not want an argument with you. But I do feel it is my right to communicate my feelings with my public representatives whether that is criticism or support. Thanks again for your interesting correspondence. Yes, you are correct. I am honest and reasonable. I am also a pretty nice person; otherwise, I would be very tempted to say: Get a Life! Are you also complaining to the Auctioneer who previously occupied my old office some of whose signs are actually still on the premises? I bet not. What about the Greyhound Bar that closed down? I bet not. I gave up my legal career in 2007 to be of service to my community and to serve my country. For a number of years I specialized in consumer law and advertising law. I can absolutely assure you that there is nothing misleading about those signs. Absolutely everyone knows I am no longer a TD. Nobody is confused. I don’t own the premises and have no access to them, I was out on the Monday following the election. That office was about serving the people which I love to do despite attacks from the likes of you who aim, but fail, to discourage. I am privileged to have been elected to Seanad Eireann where I can continue to serve the community, including you, and do my best and not just sit on the sidelines like many do. Email “Fianna Fáil senator says signs saying he is still TD “not misleading””. Feedback on “Fianna Fáil senator says signs saying he is still TD “not misleading””.